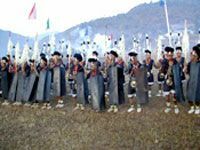 Naga's biggest festival is new year festival of January 15th, called Kaing Bi and organized by Naga festival committee who choose each year's festival location and details under the control of central government. 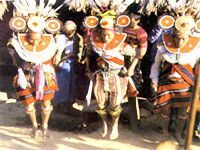 All Naga tribes send a few delegations to this occasion, thus it is the perfect opportunity to see variety of different Naga people at one place. This year six Naga tribes and Kuki-Chin tribe sent delegations and total of more than 500 people participated. At the same festival one year before, midnight of new year's eve, Naga chief made a pray pouring Naga wine at the festival site. When the pray was over, youngsters killed cattle, pigs and chickens with big knives, which were carried away by females and cooked to be served as Naga dishes at the festival. When festival starts, white and red Naga wine made of rice are served in bamboo glasses. Before and after this grand festival, various villages of Naga held their own small gatherings with children and others. Naga wear a decoration made with hair of hunted head, mostly dark but fair hairs were also spotted. They also held a kind of ritual at the seeding season in the field but people simply gather at their garden with family members only. When animism was believed by all villagers, there were many festivals almost monthly but most villages open to the foreigners today are no longer into animism, abandoning their traditional festivals. On Indian borders, western side of Mt.Saramati and Hukawing valley there said to remain several animism villages. After the new year festival, single boys and girls gather for a night and enjoy themselves, but only Naga people are allowed into the party. There are a few Bachelor Houses, called MORUNG, per village and just like Japanese youngsters in the past, they go out there and live together, which has separate rooms for different couples, according to the Myanmar Encyclopedia's 1971 issue. Other reports say inside the bachelor house there are no separate rooms and couples go outside to enjoy themselves. It is quite different from Indian Naga's MORUNG. Today, even the villages of no animism belief have a gathering at MORUNG at the new year festival. The Charter Flight leaves Yangon early in the morning for a short stop at Mandalay International Airport, and proceeds to Khanti Airport. After the arrival there, Guests are transported local motor vehicles (trucks / Lorries) to the ferry on the Chindwin River. On the other side of the river lies Sinthei Village. Then up hill drive by 4 x 4 off road pickups to Lahae, while on the way falling into a trance charmed by the panorama of Naga Mountain Ranges. Lunch Boxes will be served at the rest station on pleasant Namsalain Stream, where Guests have a chance to enjoy rare local amenities. After dinner at Lahae, a night�fs rest and further stay is arranged in the Naga indigenous huts. After breakfast, a roam or an observation in the surrounding neighborhood and villages can be taken on foot, or rent a car through one�fs own arrangement. Lunch boxes can be ordered in advance at the reception for that purpose. An informative video feature on Naga will be entertained after dinner. Guest may take part in the Naga traditional �gCeremony of Erection of Pole�h from 9:30 am to 11:00 am, and may go for a walk around the vicinity of the Festival. After breakfast, guest take their places on the festival grounds to attend the traditional �gOpening Ceremony of Naga New Year�h, commencing at 8:30 am. In the evening, from 06�h30 to 10�h00 pm, Guests enjoying the pleasure of the bonfire and Naga traditional dance while feasting on traditional food and rice wine by self – help basis. To leave Lahae at 5:00 am and head back home after having breakfast at 4:00 am. Boxed Lunch is served at Khanti Ferry. Then, take a flight at Khanti Airport and back to Mandalay and Yangon. The services come to an end at Yangon International Airport.